Grams came across this photo the other day and I couldn’t resist posting it. 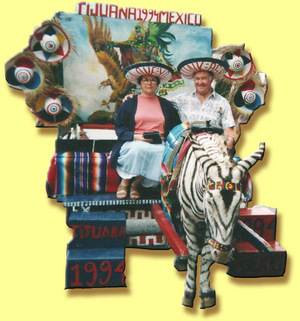 Before I convinced Grams and Big Guy that they needed to broaden their horizons, they thought that this was traveling to exotic places. What a couple of doofus'. What amazes me is that I even allowed myself to go along on this junket. The second time, we took the little red trolley from San Diego to Tijuana. It was pretty cool. We had lunch at a café that must have been around since the 1930s. The waitresses had very starched uniforms and the food wasn't nearly as fabulous as the cafe in cellar from the time before. What Grams liked best was the department store that was attached. We thought that by taking the trolley we would get around that traffic problem on the way back, but it was not to be. The line going through immigration was blocks long and then Big Guy decided to joke with inspector about the cigar in his pocket. When he was asked if it were from Cuba, Big Guy said, “sure!” Then he had to explain that he was kidding. Eventually, he gave the cigar to the fellow. Then 2 hours after we got in line, Bob’s your uncle, we were out and on our way back to San Diego. It was a Labor Day weekend and when we returned to the hotel, we found out that there was an end-of-summer concert on a pier near where we were staying. The concert was sold out, but we walked over to the next pier and got a freebee. The breeze was warm and everyone was happy. It was one of those perfect times. Oh, about the photo. Grams used it for the Christmas card that year. Inside it said, “Back from our world travels just in time to wish you a Happy Christmas.” Who says she doesn’t have a sense of humor? Did you notice that her slip is showing? Wotta woman! She's a class act! Well, back to the revising on my book. Please give what you can to Médecins sans Frontières (Doctors without Borders). Y un raton de sacristan. De su padre Pancho Villa. Grams gave me ‘The Look’ this morning. I’ve been frittering my time away, she says. C’mon, admit it, you wouldn’t want to get ‘The Look.’ She’s fearsome, the woman! I’m shaking in my boots (well, I would be if I wore boots). I need to get back to revising my book. Try not to miss me too much. I promise that it won’t take too long. Here’s a drawing from my opus while you’re waiting. We were standing in the Sala de los Abencerrajes at the Alhambra in Spain. The room started to get very crowded. Looking up at the ceiling, Grams said, “Wow, it's so beautiful. Can you believe that such horrific things happened here? You’d think that the rationality of Pythagoras’ theorem would affect them somehow. Know what I mean?” Well, no actually. Unfortunately, neither rationality nor beauty ever stopped anyone bent on creating an ugly havoc. Her thoughts about Pythagoras came from the ceiling. You see it was inspired by Pythagoras’ theorem. 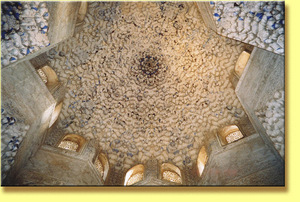 Click on the picture, there is a certain rationality in the beauty of that ceiling. As a matter of fact, there’s a rationality about the whole room. It’s amazing. What happened in the Sala? Well, the last Muslim King of Granada, Boabdil, invited the Abencerrajes family to a banquet there. The Abencerrajes were rivals of Boabdil. While the banquet was going on Boabdil had every last Abencerrajes killed. It gets better, when Isabel and Ferdinand won back Granada (and the Alhambra), Boabdil wept as he left. His mother was not amused and turned to him and said, “Don’t cry like a child over what you could not defend as a man.” Ouch, harsh Mama! 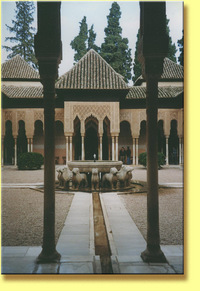 The Patio de los Leones was built earlier by Muhammed V.
Again there is a mathematical precision and lyrical beauty. There are 124 of those columns around the patio. At the centre of the patio is a fountain guarded by 12 lions. Are they symbolic of the 12 tribes of Israel? No one knows. Look at the channels leading from the fountain. 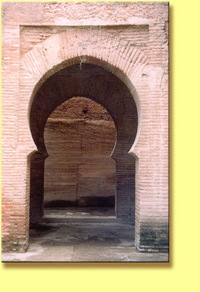 Water is an important feature in the Moorish palaces. It’s a very calming effect, but it probably also had a practical reason. All I know is that it soothes jangled nerves. We were able to enjoy the patio because it was less confining than the Sala. From there we went on to look at the gardens. That’s where I found this archway. I think that it looks like a gigantic keyhole. There are all kinds of quiet little places like this around the Alhambra. By the time we finished looking at the gardens, Big Guy said, “How about some food?” Grams had looked in the guide book and found that there was a restaurant right there. We had a wonderful and relaxing meal. I had my favourite Spanish meal: white asparagus with sliced tomatoes and topped with mayonnaise. Um, yummy! I still like the Alcazar (Reales Alcázares) better, but then it comes with Sevilla and I love Sevilla. As to reason being immortal: reason and beauty are immortal, all else with return to dust. We had decided to go to see the Alhambra in Granada, Spain. We had heard about it from people who had been there and had read about it too. It sounded like a marvellous place. It also sounded very different from much of Spain. Moorish influence in Spain lasted for a long time, but when Isabel and Ferdinand won back Spain, they set about trying to erase and diminish the Moors’ effect on Spain. But, there are places that couldn’t be destroyed. Well, not entirely anyway. But I get ahead of myself. 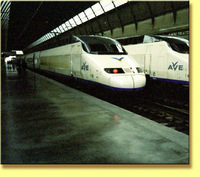 The Ave train is Spain’s bullet train. It's a fantastic ride. Not as fast as the TGV in France, but almost. Certainly, the amenities are wonderful on the Ave. We took an early morning train and had a fantastic breakfast served to us right in our seats. The train runs from Madrid to Sevilla. Granada is around 2/3 of the way to Sevilla, and the train does stop there. Well, not exactly at Granada, it actually stops at Cordoba. From Cordoba, it’s just a bus ride to Granada. When we arrived in Cordoba, we learned a valuable lesson about preparation. Grams had not called the credit card companies before we left to let them know that we would be out of the country. So, when she went to the ATM at the station, her cards were denied. All of this was settled when we got back to Madrid, but lesson learned: before you leave call the credit card companies with dates and places or they’ll cut off your water when you least expect it. All I can say is she was lucky I had cash. The bus ride to Granada was wonderful. We passed olive groves and little towns. We could see why the conquistadors felt so at home in the American southwest: it looks like Spain. The buses in Spain are run by private companies and the ones we took were all very comfortable and very nice. 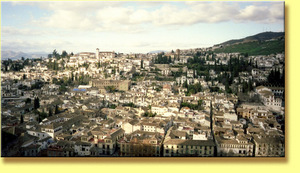 When we got to Granada, Grams thought that we could walk to the Alhambra. She had seen a map in one of her guide books that looked like it was walkable. But, as we gazed up at the Alhambra, high on the hill, we realized that a cab was a necessity. Big Guy flagged one down. When we got to the Alhambra, we realized that we weren’t alone. It was the midst of winter, but there was a crowd. Grams looked at me, “Can you imagine what it’s like at the height of tourist season?” Grams doesn’t do crowds. She panics. I took hold of her hand and didn't let go the whole time we were there. Grams found some neat pictures today. They’re almost 40 years old. When Grams was young she used to get around. In 1967 she went to the Monterey Pop Festival. It was supposed to the first one, but it ended up the last one. But these pictures weren’t from that. 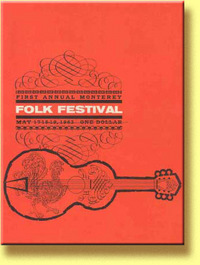 A week or two later, she went to the Monterey Folk Festival. This was not the first one nor the last. Grams got some great photos of people, performers and banners. There were quite a few of some children. Looking at them she said, "Oh my, they'd be in their 40s now." She said it had been a sunny warm day. The Vietnam war was beginning to be recognized and protested, but there had been no hint of the tumult to follow the next year. And certainly this day was so very peaceful. Joan Baez, of course, was there. Her sister, Mimi Farina was there too. That’s them in the third photo. Mimi had been married to Richard Farina who wrote, “Been down so long, it looks like up to me.” He had died in a motorcycle accident not long before that day. Joan Baez went on to lead an activist’s life. 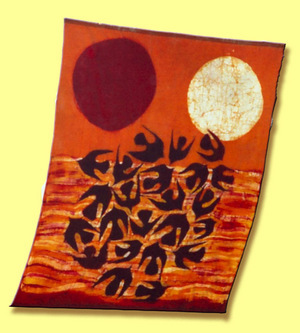 Mimi went on to found “Bread and Roses.” This organization brings music to people who are institutionalised. Mimi died not long ago, but Bread and Roses lives on. That got her a hug. Yes, I know the poster is from another year, but Grams hadn’t saved one. Now I have to get her to tell me about the Mothers of Invention. There is a Hooded Oriole and his mate in our yard. They are nesting either in the star jasmine or the orange tree, we can’t tell. They flit around very fast. Grams has been trying to get a photo of them, but every time she gets near them they fly away. Now I’ve been designated the lookout. Also, I have to keep an eye on Crankshaft. 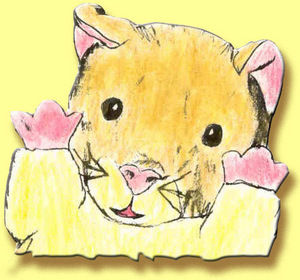 You’ll remember Crankshaft, the cat. Fortunately she’s not in her prime anymore. In her prime she could catch a blue jay on the fly and did, often. So, Crankshaft sits out there licking her chops and fanaticising about catching the birds. I have to agree with Grams, these birds are worth watching for. 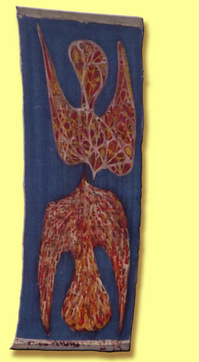 The male has a chromium yellow body and head with indigo blue wings and tails. The female isn’t as gorgeous, but she’s very pretty in her own way. They’re small and move very fast. By the time I tell Grams that the birds are there and she’s turned on the camera: they’re gone. I've a Tale to tell . . . 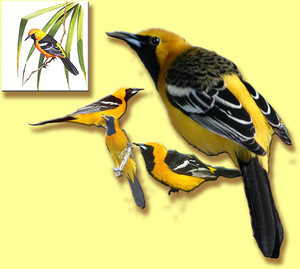 So, I wait for the very singular call of the Hooded Orioles and hope that next time we’ll get a photo of our own. Grams is turning 60 this summer and she’s been going through a gazillion negatives from old photos. She’s going to compile CDs for the darlings and their little darlings. Seeing how much her kids had changed over the years, she started wondering about how much she had changed. I knew that the moment would come when she’d ask me, “Gweeds, have I changed?” Still, when she did I wasn’t quite ready for the question. Of course we all change. 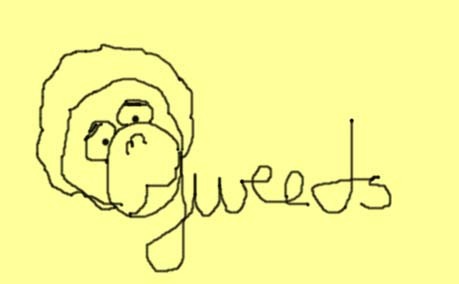 Even I, the Gweeds, have aged. 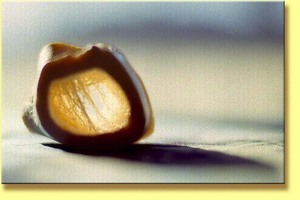 Grams took the picture of a soup bone in February of 1967. She had remembered the photo as better than she thought it was when she scanned it. I like it. I think that it looks kind of abstract. The kids merely grew up, they haven’t aged yet. 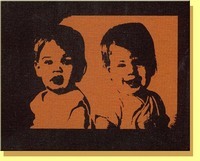 The second photo is a lithograph Grams did of the twins 34 years ago. All of Grams' kiddies are college grads; something she’s very proud of. The one on the left is now married and has two kiddies. The one on the right is a lawyer and is contemplating marriage and a kiddy, maybe. The Grams, well sure she’s changed; but she looks pretty good. So, what did I say when she asked that loaded question? “Grams, you’re like fine wine. You just get better.” That got me an “Awww” and a hug. Hey, I’m no dummy. Birthday greetings bottle of wine? I could stay with you. When your lights have gone. 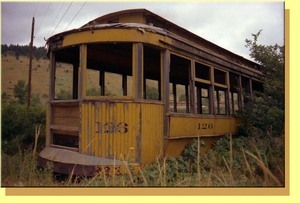 Grams was going through some old photos and she found this one that she had taken of some abandoned trolleys in Colorado around 35 years ago. She said that the trolleys looked so forlorn, she wanted to rescue them; but what would she do with them? “Is there anything sadder than an abandoned trolley, Gweeds?” Well, I could think of a few things, but I think that right now it’s time to sing the praises of the trolley. Nowadays, trolleys systems are often called ‘light rail.’ Why the change? It’s probably just because it sounds more modern than ‘trolley.’ Around the world there are many fine light rail systems. In San Francisco, the trolleys were taken out around mid-20th century, but they kept the tracks. By the end of the century, the trolleys were back. Not wanting to invest heavily in a new system, San Francisco bought up trolleys from old disused systems all around the country. I’m not sure there are even two matching cars, but they are a glorious rainbow going down Market Street nowadays. This is something that shouldn’t be missed. In Los Angeles, after taking out a trolley-subway system that was very efficient, again around mid 20th century, the county had to build an entire new system from scratch by the end of the century. This was because the land had been ceded back to the Southern Pacific railroad and the tracks taken up. The city had grown over the old system, so it was impossible to reconstruct it as it had been. Also, the city and county had grown so much, that a whole new system was the only way to go. In Europe there are many wonderful trolley systems. When we travel, Grams loves to try the subways, if there is one. Big Guy and I like the trolleys and buses. We like to see where we’re going. After humouring Grams with one subway ride, we usually go above ground after that, unless we’re in a hurry. The other thing about public transport in Europe is everyone takes it. It’s not the purview of only the working class, most people like and use public transport. 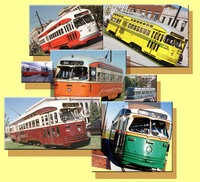 Grams has an interesting memory of the San Francisco trolleys in the late 1940s. She remembers an incident when a woman was getting off at the back doors of a trolley. The woman was wearing a full circle skirt (very popular back then) and she was a little slow getting off. Her skirt got caught in the doors and the trolley started off. She was screaming, all the people on the sidewalk were screaming. The woman fell and was starting to be dragged along Market Street. Grams says that it seemed like a lifetime, but the trolley finally stopped. The woman was bruised but okay. Her skirt didn’t fair as well. Is there a moral? “Well, I’ve never worn a full circle skirt on a trolley,” Grams smiled. 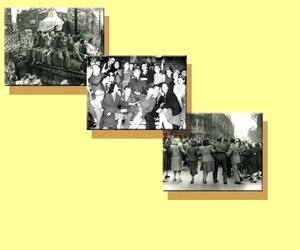 It’s the sixtieth anniversary of VE Day! Looking at these old photos, can you see the utter jubilation, the complete relief on the faces of these Britons? They would have many years of rationing and depravation ahead, but the enemy had been defeated. Millions had died. Many had willingly sacrificed themselves, even more had been sacrificed without their consent. Many would return, but not as they were ever again. Families had been torn apart never to be put together. But from all of that pain and loss was utter joy in the end. It was over. It would never happen again. True, the war in the Pacific dragged on for another three months, but the end was near and everyone was pulling themselves slowly to the finish line. Exhaustion was probably the strongest feeling right after elation. It had been six long years for Europe, six long bloody years. Now it is a lifetime ago, but we must never forget, and we must remember to give thanks today for all those who fought in our names. 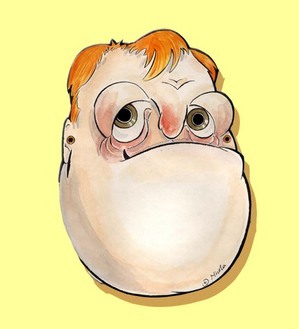 This is Charles Kennedy. Well a caricature of him, okay? He is the leader of the Liberal Democrats in England. He has done something no one (aside from Grams) thought he could do: he’s sidelined the Tories and given Tony Blair a run for his money. A quiet sort of fellow, no flash. What has he done? He and the LibDems have made their party real players. Not only are they truly part of national politics having taken 22% of the vote, they edged out the Tories for 2nd place in 160 local constituencies. This, my friend, is a major deal. The LibDems have marginalized the Conservative Party and made New Labour look over their shoulders with not a little concern. What difference 24 hours makes. At the man who broke the bank at Monte Carlo. Pauly, Pauly, Pauly. Why you do this to me, Pauly? You'll be able to say, "I knew her when . . ."
She's down for now, but she'll be back one day. Janet sur Wales, beautiful Wales! Just mine for the asking! Joanne sur The eyes have it, again! janet sur The eyes have it, again! Lynn sur The Gweeds is back! Lynn sur And here they are! 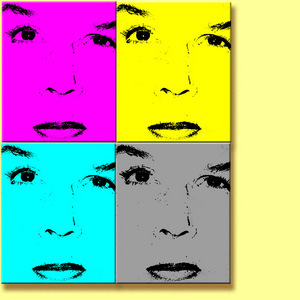 In full living colour! Over the motorway, and up the coast . . .
FeedBurner - Point your feed here. We'll do the rest.